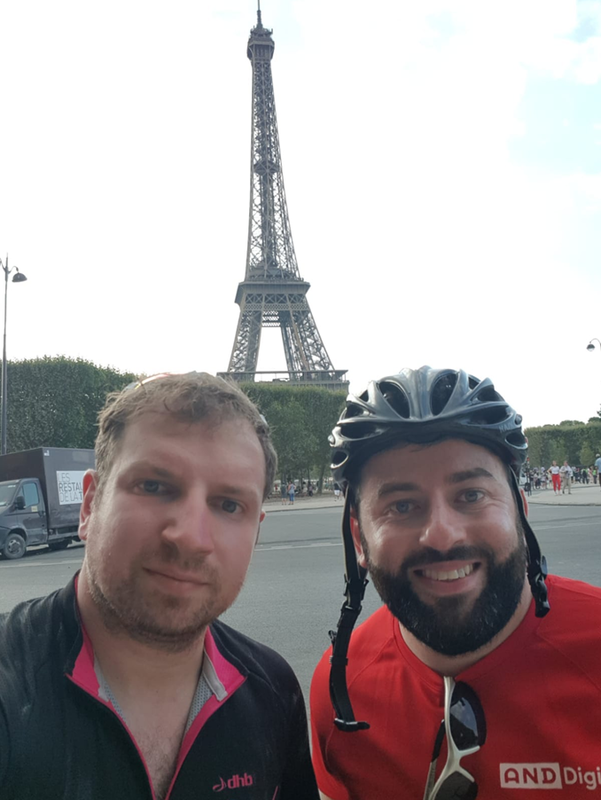 Hi, I’m Josh and this summer I cycled from London to Paris with my colleagues from AND Digital. I roped in my friend Steven (Miriam from SWAN UK’s husband) and the two of us thought it was a great opportunity to raise money for SWAN UK! Between Steven and me, we raised over £3,000 from around 125 people! How did you encourage people to donate? Nag, nag, nag. Sometimes when people say they’ll donate they sometimes forget, so it’s good to remind them. I used a lot of social media, but sometimes it’s the personal touch that helps. My friend Miriam who works for SWAN UK twisted my arm! I always try to raise money for new and interesting charities and organisations, rather than just the big ones, and having heard about SWAN UK through Miriam, it sounded like an extremely worthwhile cause that does real good for families affected by undiagnosed genetic conditions. Mainly fear of missing out, but it’s something I’ve always wanted to do as a keen cyclist. When my work decided to do it, and the cost was about half of what a company would charge, I chomped at the bit. Had you done much cycling prior to this? I’ve done a lot of cycling in my time, and have been through a few countries and challenges. I hadn’t done much recently though, so it was good to get back into it. Also, I had only been road cycling for about four months. How did you manage the training? It was tough, I’m not going to lie. Leading up to the event we had to do long 100km cycles at the weekends, and short cycles or spinning at the gym mid-week. It was a pretty big commitment. However, by training so hard, it made the actual event more fun and manageable. Plus the whole charity aspect got me through those wet and windy training days. Did you have a secret weapon? Pink grapefruit energy gels were a lifesaver, especially before a big climb. I had not understood the benefits of drafting (following each other in a line) either before this event. It made the cycle so much easier, and the group bonded more as a team. What was the hardest moment? There were a couple of tough moments, the first one being the rain on the way to Dover with no proper jacket. Having to change the route on the second day to avoid gravel, and cycling an extra 10 miles along a busy main road was really tough for me. You would think cycling over the Alma bridge and seeing the Eiffel tower, but it wasn’t for me. I felt ridiculously elated after finishing day two. Combining the tough day’s cycle, with sore legs and a few hardships that day, getting to the delightful hotel in Amiens was one of my favourite bits. We had completed two days out of three and I was in full belief that we would finish the cycle. Absolutely! 100%. I’m trying to work out what the next challenge will be. Yes! Get some training in though, as it really helps and makes the cycle more enjoyable. 22 hours in the saddle, 258 miles, 3942m ascent. Sore legs, tired behinds and happy faces. IF YOU’D LIKE TO DO A FUNDRAISER FOR SWAN UK GET IN TOUCH: FUNDRAISING@UNDIAGNOSED.ORG.UK.